Have you been thinking of putting a scope on your CMP service rifle? The best scope for a CMP service rifle needs to be well constructed and made to hold up against repetitive shooting. We’ve compiled a list of 5 of the best scopes for CMP service rifles to help you in your search. The scope you choose for a CMP rifle might be different if you are actually competing in the program with it. If you are, then you will need to look at the rulebook to see what is allowed and what is not. This guide refers to what should be considered in general when looking for a CMP scope and should fit most rule book regulations. Regulations are also different depending on the place you are competing. There are a few different factors to consider when choosing a CMP scope for your rifle. With so many scopes on the market choosing a scope can be a little daunting. This guide will help you in determining what scope is best for your needs. When looking at a scope it is important to consider how it is constructed. First, look at the main tube and the objective lens. Large-diameter main tubes are used for long-range shooting and are considered to be more durable. But a large-diameter tube also adds weight and can become more of a burden than a blessing. Objective lenses are where you have more options. They can run in sizes from 20mm to 72mm which is an incredible range. The larger the objective lens, the more light-gathering ability a scope has. Many people seem to think that the bigger an objective lens the better the scope. This is a farce as scopes with a 50mm or larger objective lens need to be mounted higher than other scopes. For a CMP rifle, a maximum objective lens of 34mm can be used. Often times you will sacrifice glass quality and lens coatings for a larger objective lens if you can’t spend the money for both. Most scopes are nitrogen purged making them weather-proof, but always double check especially if you shoot in places of extreme weather conditions. This is a critical part to consider for scoping a CMP rifle. The amount of reticle choices has jumped in the last twenty years so choosing the right one comes down to what type of shooting you are doing and your personal preference. The focal plane is another choice to make based on your particular situation and preference. Many shooters in the CMP say the best reticle for repeated success is an etched reticle. This particular reticle makes repeated shots possible without making adjustments. The only problem is you will have a hard time seeing anything smaller than 2 minute tick marks. The focal plane determines where the reticle is positioned. Marksmen prefer the first focal plane because its scale in proportion to the image is unchanged throughout the magnification range of the scope. The second focal plane allows the image to increase and decrease throughout magnification while the reticle remains the same size. The reticle and focal plane are important considerations if you want to find a reliable scope for your CMP rifle. Consider what you need before you make a choice. This is extremely important for marksmanship capabilities. Many scopes can’t hold up to the repetition found in CMP competitions. You want something durable and easy to adjust. When shooting at high distances holding zero becomes more and more difficult and precise. Cheaper scopes have what many shooters refer to as a “wandering zero” and is something you want to avoid if precision shooting is what you are looking for. Reviews can be important when it comes to holding zero. Doing thorough research and asking others in the field can help you find a great scope for your CMP rifle. This is not an area you want to skimp on for precision targeting. Clarity is directly determined by the quality of the glass within the scope. Choosing a scope with fully multi-coated lenses is the best way to go when clarity is of great concern. You will want optical clarity to see precision targets a few hundred yards away. You want lenses that produce a high-quality image at both high and low magnification. Let’s say you are taking a shot at 1000 yards and you need to compensate for wind adjustment. If you do not have good optics at high magnification you will never be able to see how strong or what direction the wind may be blowing. When shooting long range the glass is maybe the most important aspect. If you can’t see clearly 1000 yards away, you can never hope to make a good shot. Light transmission is a good way for you to decide what scopes have good glass, and which ones do not. Below you will find 5 of the best scopes for CMP rifles. Decisions are based on a combination of customer reviews, expert analysis, and company reliability. These have all done well in the field of CMP competition and beyond. Enough talking, let’s get to it. The Trijicon TR24 really shines in the clarity department. You will be surprised by the amount of light-gathering capabilities even with a smaller objective lens. The scope automatically adjusts to light conditions, making it quick and easy to use. The multi-focus eyepiece ensures edge to edge clarity and precision. The reticle glows in low-light situations with no batteries to worry about. The generous eye relief will protect you even from high caliber and high recoil rifles. The construction of this scope makes it incredibly durable. I’ve been hunting and knocked my scope against a tree and completely ruined my zero. 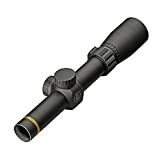 This scope is a lightweight, durable choice good for many different types of shooting. The reviews on this scope are nearly all positive. One enthusiastic customer said this scope can stand up to optics costing 4x as much. Another said it solves two problems with one scope by acting more like a red dot at 1X and an accurate scope at higher magnifications. This scope is sure to fulfill the needs of any CMP rifle. Leupold has been making high-quality affordable scopes for many years. This one is a good choice for CMP rifle competitions with a 1.25-4X magnification setting. 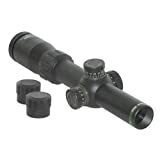 You will notice that this scope is great for unpredictable situations. You will appreciate the Firedot reticle, which has eight different settings to function in any situation and keep you on target. The motion sensor technology automatically deactivates after 5 minutes of no use and instantly reactivates as soon as motion is detected. This scope also has a twilight max light management system which is fancy talk for delivering as much light to your eye as possible in any given situation. 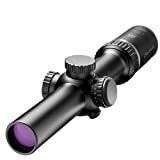 Seeing your target in low-light conditions is a prime feature of this scope, and provides optimal light-transmission. Most of the reviews of this product praise it as a great scope. One customer said it works like a red dot at close range and the zoom out to 4X makes hitting targets further away from you a breeze. The weight and size are optimal for repeated shooting. Here is a scope that can fit nearly any budget and still fulfill your needs. The Burris MTAC is covered under warranty for life. It works well if you need a true 1X that acts as a red dot sight but holds clear at 4X. This makes it good for long range shooting and quick target acquisition. The eye relief is good for the money and will provide enough room to use the scope to its fullest extent. The reticle is clear, but a little busy for some people. It is etched in the scope so it will be there even if your battery runs dead. Sighting in this scope is fast and easy, and once you have zero it holds it. The brightness switch for the illuminated reticle has an off position between each level of brightness making it easy to go back and forth between brightness and the off position. The glass itself is comparable to scopes twice or even three times as much. Overall it is seen as a great scope. A couple of things that people were not impressed with was that it didn’t come with scope covers and that the zoom ring is harder to turn then it should be often requiring two hands to turn it. Most people, however, seem to be very pleased with this scope, especially because it is cheaper than many of its competitors. This scope is a dream for anyone on a budget. The glass and clarity are stunning and not just for the price. The low-profile power adjustment ring is impressively smooth, even though it is a little tight. 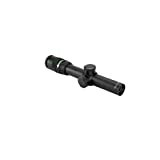 This scope comes with the twilight management system available on many Leupold scopes. This makes it much easier to see your target in low light situations. The scope is a simple design but exquisite at the same time. The MOA system is smooth and easy to adjust with just your fingers. The duplex reticle is clear and simple, not getting in the way of your shooting. The lenses are coated with Mil-spec which provides excellent abrasion resistance. Many customers praise the simplicity of these scopes. One customer stated that it is clear, crisp, and lightweight. All of this combined in a small package. With fewer parts, it has fewer issues with anything failing within the scope. For the price this scope is offered for nothing on the market can even compare. Here is another great choice for your CMP rifle that has many options for a scope in this price range. The fast-focus eyepiece makes on the fly adjustments easy. The Speed Shot system allows for the reticle to be seen with illumination during daylight hours without causing any tube glow within the scope. This scope is ideal for many different styles of shooting, including CMP shooting. The reticle itself is a little unorthodox as far as reticles go as it is just a black dot. No crosshairs, reference lines, or mil-dots to speak of. Its simplicity is either praised or frowned upon. The scope is of rugged design. It will give you what you need at a price that is affordable. It can hold up to recoil and will give you minimal zeroing issues. All in all, it is a decent budget red dot scope. There were some issues for customers with this product. If you are looking for a scope to go further than 100 yards this one is not the one you want. It could be a bit smaller and lighter for the application it is meant for, but will still perform for most people. How do I know if my scope is within regulation for CMP competitions? – The CMP rules can be found online for anything you might have questions about. Generally, no scope above a 4.5 magnification can be used, but there are many different categories. Here is a site that answers many FAQ’s that you may have about the competition. What reticle is best for CMP rifles? – Generally the less “busy” a reticle, the better. BDC reticles or hash mark reticles are also favored by competitors. If you have the ability to try a few reticles then I recommend that as it is more of a preference than true science. What is meant by “true 1X magnification”? – This refers to a scope that has actual 1X magnification. Some scopes will say 1-6X, or whatever it may be but actually are 1.5X. A true 1X magnification works more like a red dot sight where you can keep both eyes open for quick target acquisition. The best scope for CMP service rifle is subjective and will depend on a few key factors. The magnification and clarity are both important aspects to consider. Price is also a factor for many people because you don’t want to spend more than you need to for a good scope. Anyone of these scopes will work well for a CMP service rifle and cover a wide range of budgets. It is a good idea to reflect on your needs and what you will be using it for. Hopefully, you found the information in this article to be of use in finding a scope for your CMP service rifle.